Surabaya Bromo Malang Tour Package 3 Days 2 Nights Is a vacation package tours to Mount Bromo with combination the tourist attraction in Batu Malang East Java Indonesia, such as Apples Plantation, Jatim Park 2 Batu Malang (Batu Secret Zoo, Museum of Animals),Coban Rondo Waterfall,Singosari Temple and and many more Malang tourist spots. Upon arrival in Surabaya (Train Stations,Terminal,Airport,hotel), you will be met with our tim and transferred to hotel in Bromo. Free program for the rest of the evening. Morning call at 03.30 am. Start your journey by jeep 4WD to enjoy the beauty of nature and the splendid sunrise at Mount Pananjakan peak 1 (subject to the weather condition). Proceed to Mt. Bromo crater through the shimmering sea of sand with jeep. From parking area jeep in sea of sand your could ride a horse or walking toward stair mount bromo tour and enjoying mount bromo crater. After finish enjoying mount bromo back to hotel with the jeep and breakfast at the hotel. Loading your bags,check out time from hotel bromo and transfer out to Malang. When the journey towards to Malang city, visit Singosari temple and apples plantations.Stay overnight in Malang/Batu Hotel. Free program for the evening. 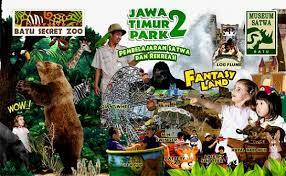 After breakfast at the hotel, continued journey to tourism attraction Batu Malang ,visit to coban rondo waterfall and Jatimpark 2 (Batu Secret Zoo + Museum of animals). Back to hotel and check out,depart to Surabaya,arrival in surabaya (Airport,Train station,Terminal,Hotel) tour ended.